A print developing error at the bottom, stains and an uninspiring background called for some drastic manipulation work. 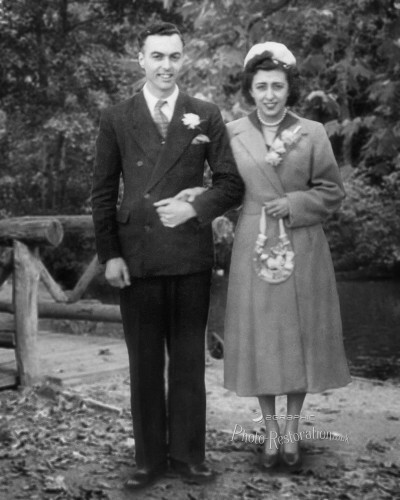 We added a new background to this old wedding photo and repaired any damage to the couple to give our customer a photograph they could cherish. 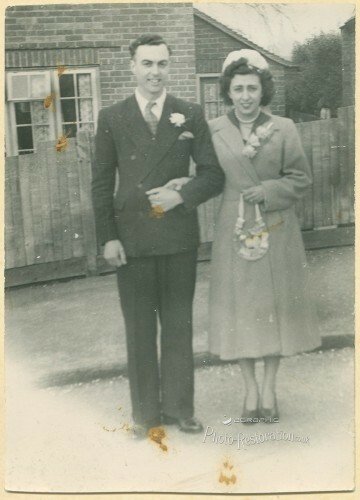 I have received my photo and am very pleased with the result.It is amazing how you have restored it, worth every penny! and I will not hesitate to recommend you to all my family and friends. I shall be sending you more photos soon. Have received the photos that you did for me and they are framed and on the wall. The quality is excellent and many thanks for bringing some old photo’s and memories back to life, very much appreciated. I mess about with Photoshop to a small degree so really appreciate the work that has gone into revitalising my photos. Thanks again. The photo is great I was very pleased with the result and it was delivered swift and securely. It was a present for my Dad and he loved it. Thank you very much, I will recommend you to my friends and family. Thanks for the couple of restorations you sent. I have to say we were really delighted with the results – just outstanding. Was also pleased with the speed of service and the way you actually reply to emails I sent to you – unlike so many online businesses these days!